Winemaker’s Notes: The Nebbiolo is DOCG Barolo coming from the best land in the Barolo region and is blended with the Barbera and Merlot for richness and color. This wine was created so that everybody could have a taste from one of the most exclusively wine growing region of Italy. Bin 721 NBM is made with only sustainable farmed grapes and has no man-made chemicals added. This wine is rich with notes of red berries, blackberries and a hint of smooth chocolate. Delicious with steaks, stews, pastas, and aged cheeses. 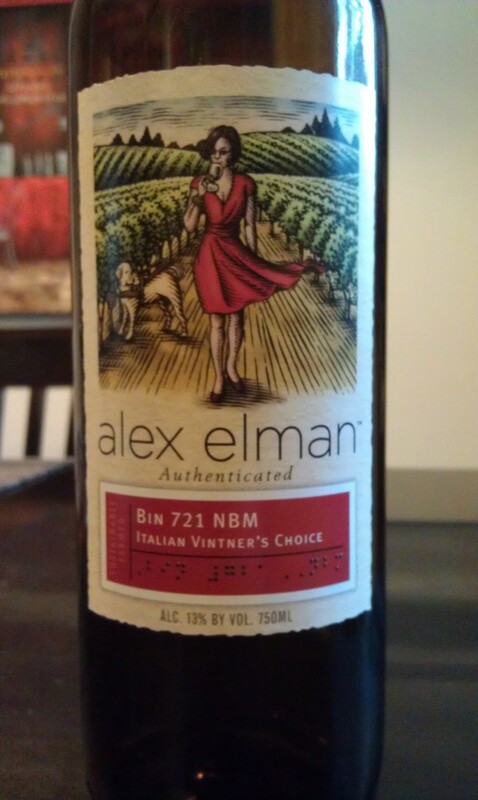 My Review: I’ve enjoyed the wines of Alex Elman in the past, so I was pleased to try a bottle of the Bin 721 NBM from Ms. Elman, though it certainly didn’t hurt that Italian wines always have a fond spot in my heart as they were my gateway into the world of wine. So it was that when making up a dinner of pasta with meat and red sauce right before the holidays descended on us, my wife and I decided to open up this bottle and see what she had to offer. In the glass the wine was a nice dark garnet color with hints of a rusty brick red slashing through it that I found rather appealing, none of which let through much light when held up. On the nose I picked up red berries most prominently, which carried through to the mouth. In the mouth the wine was medium-bodied with a nice dryness that I found appealing when paired with our dinner of pasta and sauce. The red berry flavors continued from the nose, along with some blackberry, though I never got the chocolate that was advertised. The wine was a good pairing with the meal, and I would have liked to try it with some nice hard cheese, steak, or a good wood-fired pizza. Having spent a Spring in Italy as a child at a vineyard, this certainly reminded me of sitting out with friends and family drinking wine and enjoying good food. For the price it’s a great value, as it certainly drinks better than the $13 they suggest. If like me you have affection for the Italian wines and are looking for a good value one, this could certainly be one to look to. On a side note, I would like to mention that I continue to like that they place the name of the wine in braille on the label, as Ms. Elman is blind and I think it’s a nice touch. Editor’s Note: I received this wine as a free sample.